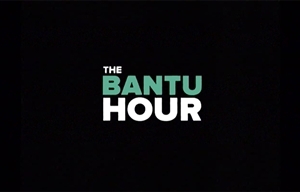 The Bantu Hour is a South African satirical sketch and variety comedy show created by a comedy troupe comprised of stand-up comedians and professional actors, featuring archetypal South African characters. Hosted by comedian Kagiso Lediga and featuring musician Hugh Masekela as the house bandleader and co-host, the show stars progressive local comedians and actors. Each week the show hosts a celebrity guest, a stand-up comedian and a musical performance to close the show. The series features an ensemble cast of repertory actors. The series is multilingual, with English subtitles. The writers include Kagiso Lediga, Hugh Masekela, Karabo Lediga, Themba Vilakazi, Camilo Saloojee, Muzi Dlamini, Christopher Steenkamp, Mojak Lehoko, Loyiso Madinga, Nina Hastie, Dusty Rich, Stig Sesanti, Tats Nkonzo, Mo Mothebe, Donovan Goliath, Jason Goliath, Jason Cope and Reabetswe Moeti. The Bantu Hour is produced by Gunga7 (formerly DiPrente) and directed by John Barker, Kagiso Lediga and Karabo Lediga. The executive producers are Hugh Masekela, Themba Vilakazi, Kagiso Lediga, John Volmink, Isaac Mogajane, Luke Henkeman and Nomsa Daniels. Tamsin Andersson is a producer.